2.8 WebService – Who is? Only managers (julius, nero) have the rights to start processes “Overtime Work ” and “Business Trip ”. All actors can start the process “vacation”. The boss of gaiua is julius, the boss of marcus and attila is nero. Organization function determines boss of the employee. This function is used in “vacation” process. Manager asks the employee for overtime work. The employee accepts or declines the proposal. After that the manager receives a notification of acceptance or rejection. The new instance of “Overtime Work” business process will be created and the employee (Gaiua) will receive task. 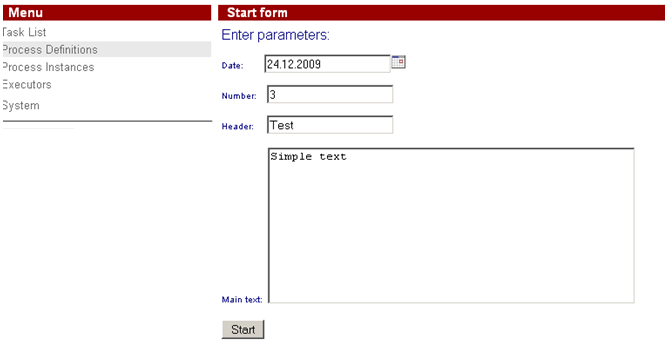 Log in as employee, selected on the start form (Gaiua). After login the task list will open. Click the “make a decision” task. Choose “accept” or “decline” (e.g. 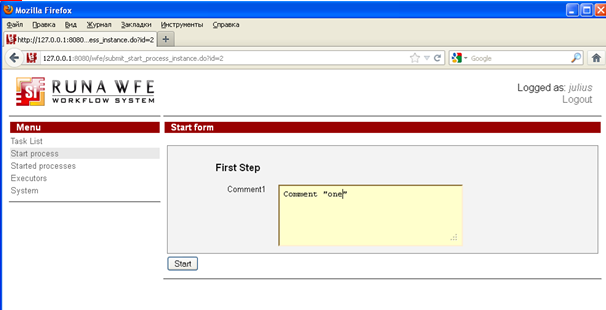 “accept”), fill the «comment» field and click «Task is done». In the task list you'll see either "Notify of rejection" or "Notify of acceptance" depending on you previous choice as Gaiua. In this example you see “Notify of acceptance”, click on it. By clicking “Task is done” you’ll finish the process. An employee requests for vacation. The boss accepts or declines the request. 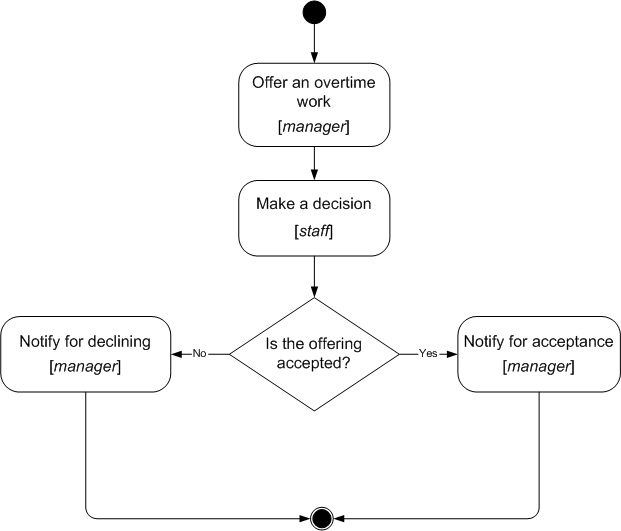 If the request is rejected, the employee receives notification and business process ends. If the request is approved, a human resource inspectors receives task “check rules and technologies”. Human resource inspector checks business process data. 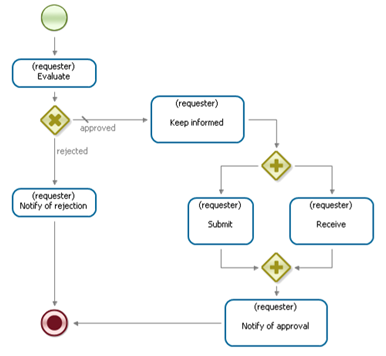 If check result is negative, the business process returns to the “evaluate a request” state (the loop example). Boss accepts or declines the request. If the check result is positive, the business process sends task for hardcopy request submission and official order issuing. Employee receives task “submit the written request for a vacation to the human resource department”, the human resource inspector receives task “receive a written request from employee” concurrently. Upon completion the task the human resource inspector receives next task “make an official order”. After all these tasks are done, the business process ends. Note. Organization function determines boss for every actor. Actors with login names starting with “g” have boss julius, the others – nero. Login as Cleopatra. Click on “Make an official order” task. Note. This process is quite complex. 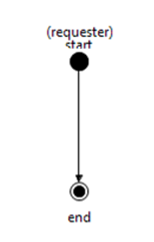 This documentation contains only short description and the business process graph. A manager sends an employee to a business trip. The employee receives notification. If the business trip is local, the business process ends. If business trip type is “to another region”, a human resource inspector receives task “make an official order”. The employee receives task “sign an order” and human resource inspector receives a task “receive a signature on the order” concurrently. Employee receives task “receive a business trip warrant” and inspector receives a task “give a business trip warrant”. Bookkeeper issues and employee receives the business trip money. After employee returns from the business trip, employee submits and bookkeeper receives the business trip financial report. The business process ends. Note. 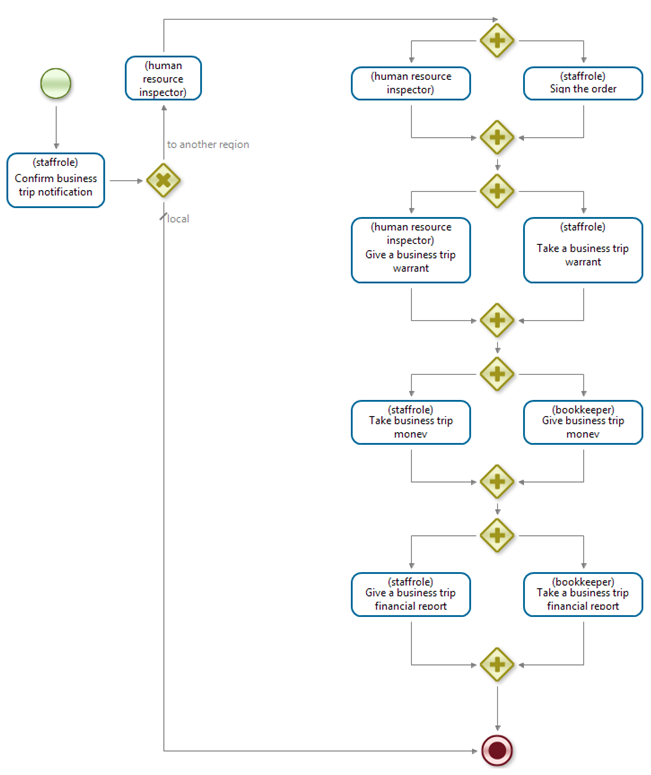 If to click on the "Start process" menu option and then click on a business process name this business process graph can be seen along with some other information. In the start form of the process the user uploads a file. Then in the first task of this business process a user downloads the uploaded file. 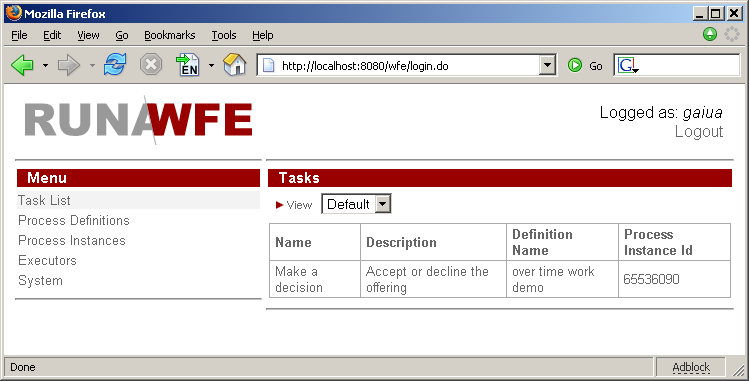 Note: Since version 4.1.0 jquery plugin upload is used to upload files to WFE Server. If form is not validated file is saved anyway. Open the task. If you click the file name in the task form, you will trigger the file download. Click "Task is done" to finish the process. 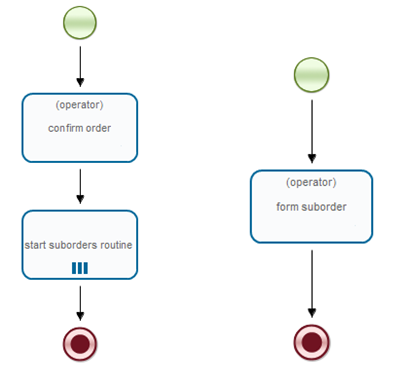 This process is an example of ExecuteFormulaActionHandler handler. It's a universal ActionHanlder that is used to change business process variables values. 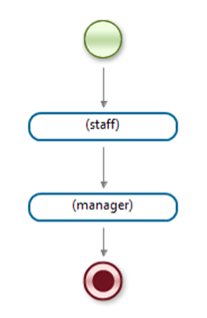 This process is an example of ExecuteFormulaActionHandler usage. 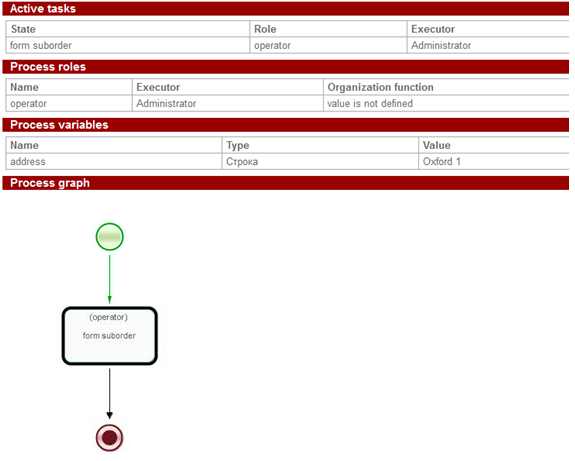 ExecuteFormulaActionHandler is a universal ActionHandler designed for mutation of business process variable values. Click on "Start process" menu item. 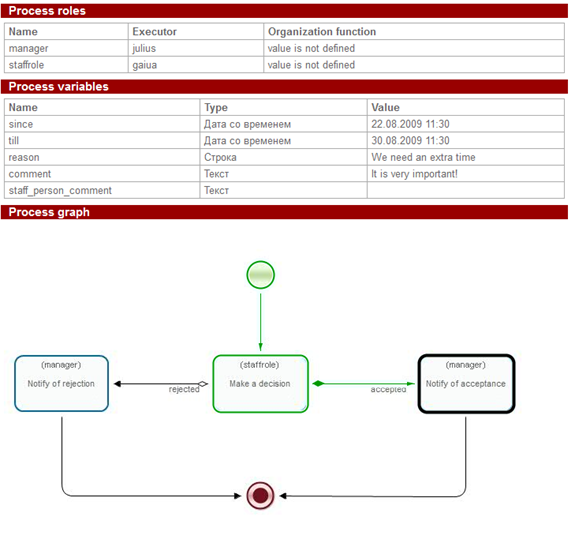 In the appeared table find a line with «Execute Formula Demo» business process and click on the process icon. This means that the handler makes a copy of the uploaded file and the result can be seen on the form 9 where you can download both files. This is the simplest demo process. It doesn't have any activity nodes and only displays a “Hello World!” text on the start form. 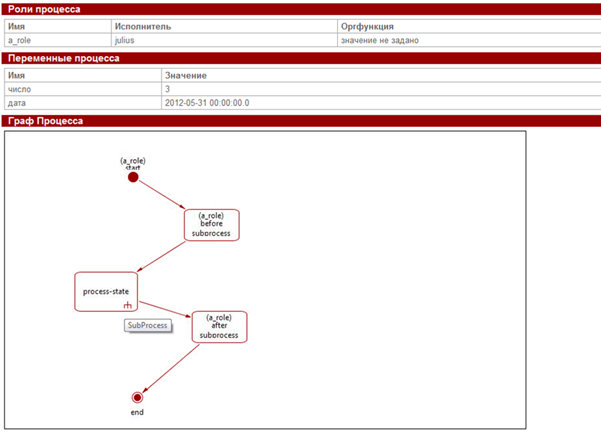 In the appeared table find a line with «Hello World» business process and click on the process icon. The process has no activity nodes and transits to the end state right after the starting. This demo process is developed in BPMN notation and shows the work with decisions, fork/merge and forms. User starts the process, types in the comments in corresponding text fields, approves/rejects the request. Find "BPMNdemo" process in the list and click the name of the process. Then it's necessary to type the first comment in the text field and click "Start". A process instance will be created and started. Then the control will be passed to the "Evaluate a request" node, where it is necessary to type the second comment to the text field and to make a choice (to approve or reject the request) with the help of radio button. Then the merge happens followed by “Make an official order for vacation” task. Here all the previously entered comments are shown as well as a full name of the user who started the process. 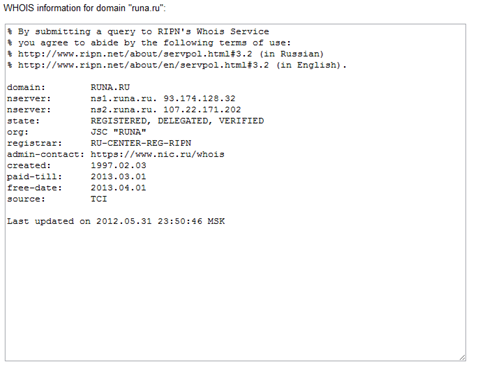 A user enters the domain name and the WebServiceBot executes a task “Load whois information” with the help of WHOIS service. On the start form enter the domain name and press "Start" button. In this process the idea of passing a task to bot is demonstrated. 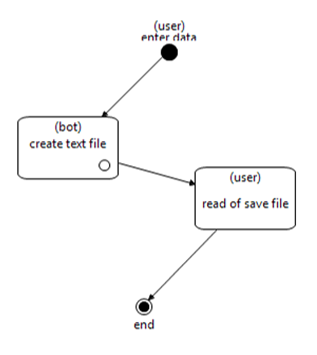 The user runs a process, a form with text "before activity" is formed in the next activity node and is passed to UniversalBot bot, which performs a DoNothing task (ru.runa.wf.logic.bot.DoNothingTaskHandler). 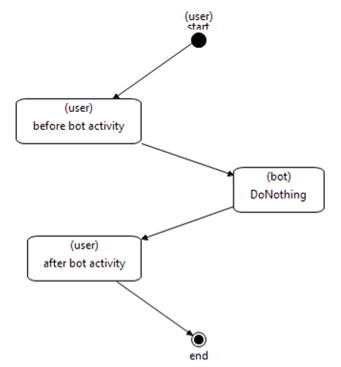 Then a form "after bot activity" is presented to the user. In the task list the “before form activity” will appear. Execute it and then it will be the universal bot turn with DoNothing task. Note. It is always possible to see the current state of the process instance execution. Click the "Started processes" menu item and then click on the corresponding business process instance. A short description: A manager asks to prepare a report. One of the employees prepares it and the manager reads it. Login as Julius. Open the task "read report". Click the "tasks" menu. Open the task "read or save file". Read or save file. To add a timer to a state you need to add a timer element to a state in the Developer Studio. 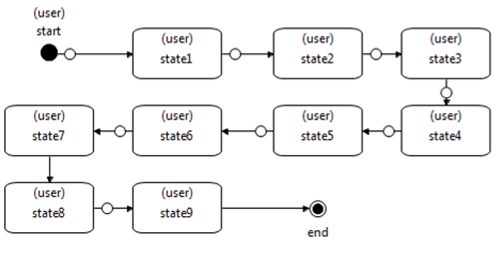 A user runs the process, the control goes to "before timer triggered" state. 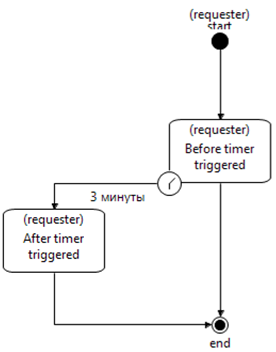 If the user completes the task in 3 minutes period, the process will end, else the control will come to "after timer triggered" state. Find "TimerDemo" process in the list and click the name of the process. The process will start. "Before timer trigger" task will appear in the task list. After 3 minutes, it will dissapear and "After timer trigger" will be in the list instead. Any process many be included into other process as its subprocess. A subprocess can be independent (that means it can be run without parent processes) or dependent from its parent (that means it cannot exist without parent context). One and the same subprocess may be included into several different processes. 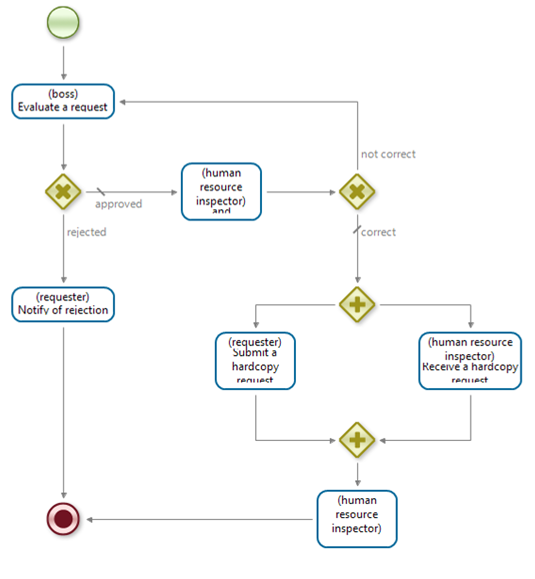 There's a subprocess element in graphical process designer to manage subprocess in the process graph. See Graphical Process Designer User Guide for details. 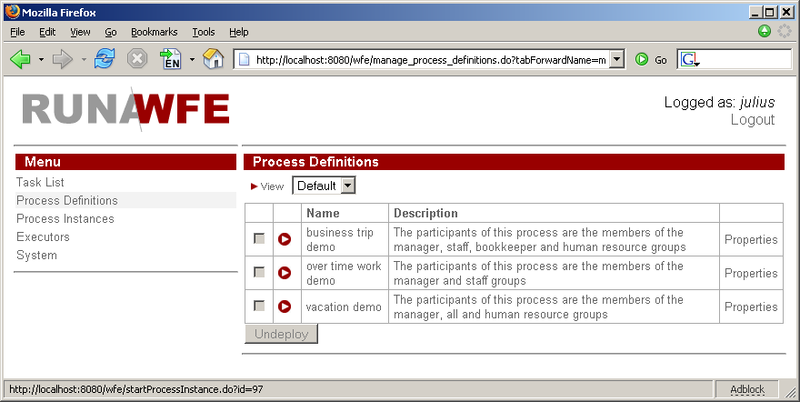 Find "MainProcess" process in the list and click the name of the process. The process will start. 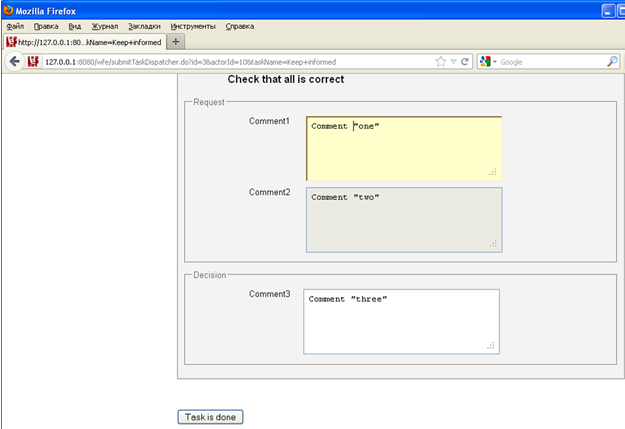 On the "before subprocess" task form click "Task is done"
Find tasks that belong to the MainProcess instance in the task list. In fact these tasks belong to subprocess SubProcess, but in the "Process Definition" column you will see the name of the parent process. Do the subprocess tasks by opening them and clicking "Task is done" button. Then do the last parent process task "after subprocess". The process will be over. If you want to view the process properties, go to "Started processes". Open just finished MainProcess instance. 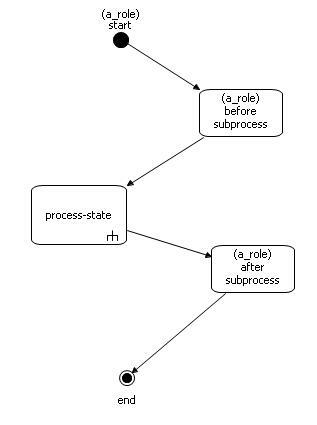 On the process graph click on the subprocess state and the page with subprocess instance properties will appear. When it's necessary to perform one and the same sequence of actions for each element value of a list in RunaWFE it's possible to use MultiInstance or MultiTaskState. 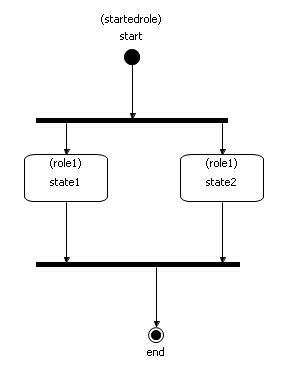 In this example MultiInstance is used. For the sequence of action a MultiInstance subprocess is created and in each main process instance there will be as many MultiInstance subprocess instances started as many elements in the variable of multiinstancelink. See more details creating process with multisubprocess. A client has several addresses. The order implies delivery to each of the client addresses. In addressArray variable there´s a list of client addresses. In the main process instance there will be as many subprocess instances created as addresses in the list. In each subprocess there will be a variable with one of the addresses. In order to start "MultiInstanceProcess" click on "Start process" menu item, find "MultiInstanceProcess" in the list and click on the process name. On the starting form type in the addresses of a client (the number of addresses equals the number of started MultiInstance subprocesses. Go to the "Task list" and confirm the order. Just to see it with your own eyes go to the "Started processes" and see how many MultiInstanceSubProcess are started. Click on one of them and check out the address variable value in subprocess properties. Check out this value in another subprocess of this process instance. 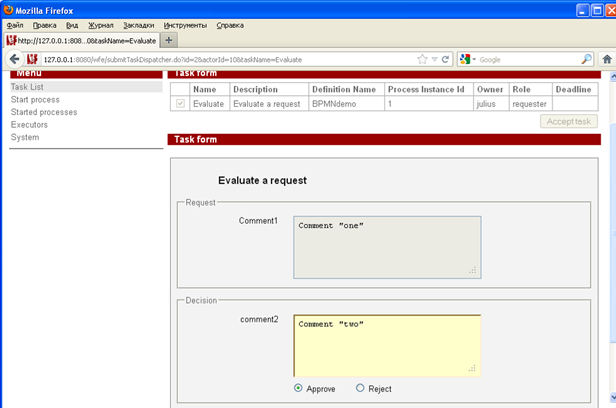 Go to the "Task list" and form suborder for delivery in each subprocess. This page was last modified on 19 May 2014, at 02:57.